Q: Where is eco-SPRAY® manufactured? osmosis water, fish polypeptides, seaweed, and Hinokitiol. Q: Does it work on any vehicle? A: Yes it can be used on all gasoline, diesel, and hybrid cars. Q: Does eco-SPRAY® also work for trucks and buses? data for these larger vehicles. Q: How long does a bottle of eco-SPRAY® last? Q: How long can eco-SPRAY® be stored? one year of purchase, and stored in a cool, dry place. Do not store inside of your car for long periods of time. Avoid exposure to direct sunlight and high temperatures. Q: Will eco-SPRAY® hurt my engine? there is no risk of engine damage. Q: Can I apply eco-SPRAY® myself? make it easy to apply yourself. Q: How long after I apply eco-SPRAY® does it take to see results? engines typically improve faster than newer cars. 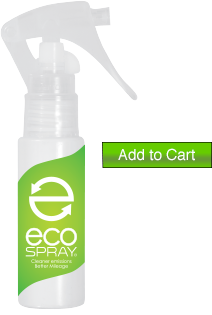 Q: How long does eco-SPRAY® last? A: It is recommended to repeat the procedure every 3000 miles. Q: How does eco-SPRAY® improve gas mileage? your engine to eliminate carbon sludge and static electricity. which translates to higher power and improved gas mileage. Q: How is eco-SPRAY® different from other products? safe to improve vehicle performances.